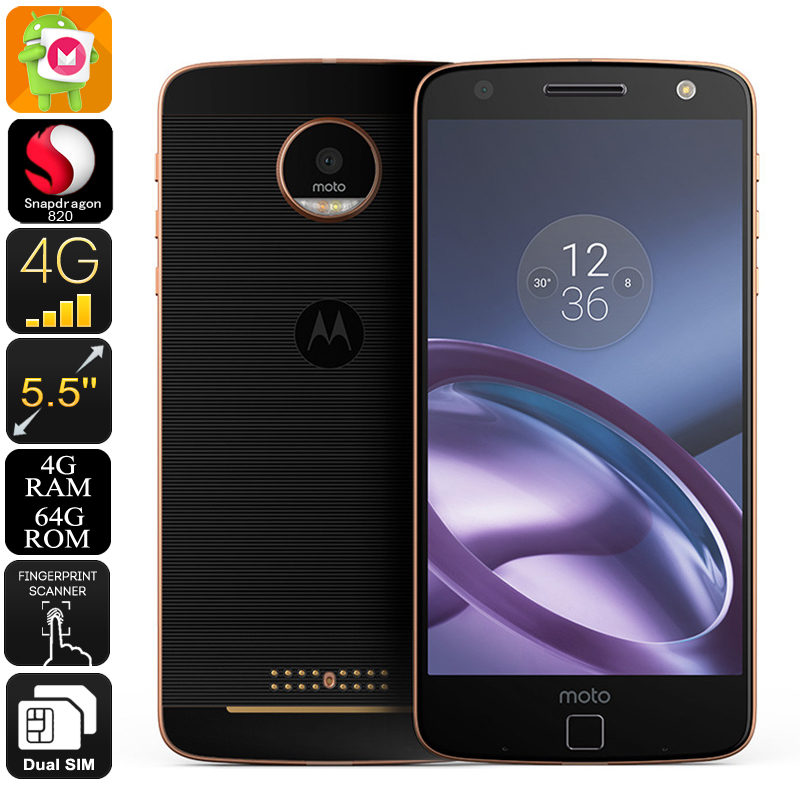 Successfully Added Lenovo MOTO Z XT1650 Android Smartphone - Android 6.0, Dual-IMEI, Snapdragon 820 CPU, 4GB RAM, 2TB External Memory, 4G (Black) to your Shopping Cart. Meet the MOTO Z XT1650, a beautiful and sleek high-end Android smartphone that comes packed with tons of the latest hardware and software alike – providing you with an abundance of features and an extraordinary smooth user experience. With its Android 6.0 operating system you will be guaranteed that this Chinese smartphone operates fast and smooth – allowing you to take the absolute most out of all the amazing features this Android phone has to offer. Packed with a massive yet lightweight 2600mAh battery, this 5-Inch smartphone provides you with enough juice to get trough the most demanding of days without you ever needing to worry about running out of power while enjoying all this magnificent smartphone has to offer. With its Dual-SIM capabilities and two IMEI numbers, this Android smartphone takes your connectivity to a whole new level. Being reachable on two phone numbers simultaneously while using merely one device provides you with the perfect platform on which to separate your work and private life. Additionally, it offers you the possibility to throw in a local foreign SIM card while traveling abroad, allowing you to stay connected no matter where you’re at. Besides its two IMEI numbers, this Dual-SIM smartphone also supports 4G connectivity and Dual-Band Wi-Fi - further enhancing the connectivity of this beautiful Android phone. From now on you’ll be able to browse the web at lightning speeds and stay connected to all your friends, family, and colleagues at any time. Featuring the Snapdragon 820 CPU, this powerful Android phone provides a smooth and ultra-fast performance. Built for speed and energy efficient usage, this Quad-Core CPU that has been clocked at 1.8GHz allows you to engage in the most demanding of mobile activities without slowing down or heating up your device. Besides its powerful CPU, this Chinese smartphone furthermore packs an incredible 4GB of RAM, letting you engage in excessive multitasking activities as if it’s nothing. Play games, watch FHD movies, and enjoy multiple of the latest mobile applications at once – no matter what you throw at it, there is nothing the MOTO Z XT1650 Android phone can't handle. Packing an absolutely stunning 5.5-Inch Super AMOLED display, the MOTO Z XT1650 provides you with breathtaking visuals, high detail, and vivid color. With its 2560 x 1440 resolution it allows you to enjoy your favorite media and games in mesmerizing quality, offering a cinematic experience from the palm of your hand every time you play media on this magnificent Android device. In order to increase your media experience even further this Android smartphone packs the Adreno 530 GPU that supports high detail and amazing graphics – allowing you to engage in the most graphically demanding games without dropping a frame. Offering 64GB of internal memory and the possibility to insert an absolutely mind blowing 2TB of external storage, this Chinese Android phone is guaranteed to hold enough space for you to save all your favorite files, media, and games alike. So head out to the play store and download the latest games, movies, and more – with the MOTO Z XT1650 in your pocket you’ll be able to carry along an unlimited amount of mobile entertainment at any given moment, ensuring that you’ll never have to be bored again. The MOTO Z XT1650 Android smartphone comes with a 12 months warranty, brought to you by the leader in electronic devices as well as wholesale electronic gadgets..